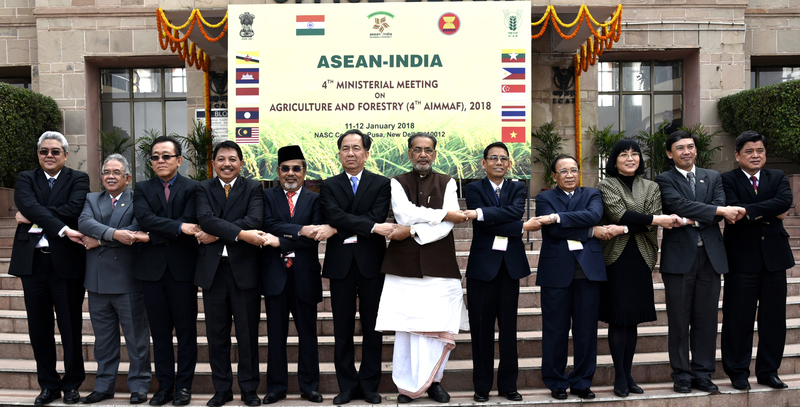 The Union Minister for Agriculture and Farmers Welfare, Shri Radha Mohan Singh along with the ASEAN Ministers releasing the Joint Press Statement, during the 4th ASEAN-India Ministerial meeting on Agriculture and Forestry, in New Delhi on January 12, 2018. New Delhi: Union Agriculture and Farmers Welfare Minister, Shri Radha Mohan Singh addressed at the 4th ASEAN-India Agriculture Ministers Meeting held in New Delhi, today. Shri Singh said that the 1.35 billion people of India are keen to welcome the ASEAN Leaders as our Chief Guests at India’s 69th Republic Day Celebrations. India is committed to work with ASEAN countries to develop rural areas and eradicate poverty in line with the implementation of the ASEAN Community Vision 2025 and the UN 2030 Agenda for Sustainable Development. We look forward to a closer cross-sectoral collaboration with ASEAN bodies on rural development and poverty eradication, agriculture, social welfare and development and health, among others, to ensure sustainable and inclusive development in the region. It gives me immense pleasure to welcome the Hon’ble Agriculture Ministers and the Senior Government Officers and dignitaries of ASEAN Member Countries and express my happiness to be amongst our ASEAN friends today and address you on this momentous occasion. India has always been keen to working closely with ASEAN and I am confident that we can build upon the progress achieved in the past years and realise the full potential of our partnership in bringing greater peace, progress and prosperity to the people of the region. India’s vision for the region, which places ASEAN at the core of India’s Act East Policy, has been shared with the ASEAN leaders by the Hon’ble Prime Minister of India on a number of occasions. 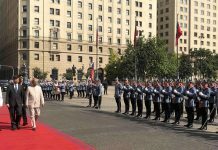 During his recent visit to Manila to participate in the 15th India ASEAN summit he reaffirmed India’s commitment to work closely with the ASEAN countries to realize our common goals and objectives. In the words of our Prime Minister “ASEAN began in times of a great global divide, but today as it celebrates its Golden Jubilee, it shines as a beacon of hope; a symbol of peace and prosperity. The 1.35 billion people of India are keen to welcome the ASEAN Leaders as our Chief Guests at India’s 69th Republic Day Celebrations”. India is committed to work with ASEAN countries to develop rural areas and eradicate poverty in line with the implementation of the ASEAN Community Vision 2025 and the UN 2030 Agenda for Sustainable Development. We look forward to a closer cross-sectoral collaboration with ASEAN bodies on rural development and poverty eradication, agriculture, social welfare and development and health, among others, to ensure sustainable and inclusive development in the region. Agriculture and food security remain among the prime areas of focus of the Government of India with the key objective of ensuring food and nutrition security at affordable price in an eco-friendly environment. Agriculture is particularly important in the context of our region as majority of our population is still dependent upon it to earn their livelihood. Growth in Agriculture also plays pivotal role in supplying raw material to our booming manufacturing sector. Agriculture sector in India provides employment to more than 58% for rural people/youth as their principle means of livelihood besides providing entrepreneurship opportunity. India has made great strides in the field of agriculture and allied sectors. During the past decades, India experienced Green Revolution and the White Revolution which paved the way for self-sufficiency in food and milk production. Moving beyond mere self-sufficiency in food and milk, we have also done very well in horticulture, fisheries and pulse production, and are working towards improving post-harvest management and development of cold chain infrastructure. Our programmes and policies are targeted to develop agricultural technologies and package of practices ensuring food and nutritional security to all our fellow citizens, to ensure livelihood security among the farming community and towards doubling farmers, incomes by 2022. Agriculture is equally important for ASEAN as the majority of ASEAN countries, like India, are agrarian economies. ASEAN and India also face similar challenges such as climate change, shrinking land base, dwindling water resources, shortage of farm labour, and increasing costs and uncertainties associated with volatility in national and international markets. Diversification towards higher value crops and livestock would be the answer which will not only improve farm incomes but also to reduce stress on the scarce natural resources. Transboundary diseases also remain yet another important areas of attention which requires urgent focus and collaborative efforts. This calls for close cooperation between our countries to tackle them. Ever since India became a Sectoral Partner of the ASEAN in 1992, the India-ASEAN partnership has grown commensurate with the increase in our collective capacities and our growing economic integration. Today there are 30 annual dialogue mechanisms between India and ASEAN member states, including a Summit and six other Ministerial level meetings in key sectors, besides Agriculture. Cooperation in agriculture and forestry remains an important part of this collaborative agenda between ASEAN and India. Our officials have been exchanging views through the ASEAN-India Working Group on Agriculture established in 2011. The first Ministerial Meeting on Agriculture and Forestry also took place in 2011 in Jakarta which endorsed a Medium-Term Plan of Action for ASEAN-India Cooperation in Agriculture and Forestry for the period 2011-2015. Our Ministers have already met thrice before this ASEAN-India Agriculture Ministers Meeting. We have been engaged in several projects of mutual interest and our experts, farmers, agricultural scientists and officials meet regularly to take forward our collaborative agenda. In view of our common interests and potential opportunities for cooperation in agriculture and forestry between India and the ASEAN member countries, a comprehensive ASEAN- India work plan for strengthening Cooperation in Food, Agriculture and Forestry (AIWGAF) 2016-2020 is already in operation. I would request that all ASEAN Embassies based in New Delhi and our new Resident Mission to ASEAN in Jakarta with a full-time Ambassador as well as those in different ASEAN nations to fully involve themselves in the process of enhancing cooperation and effective implementation of our collaborative agenda in the agriculture and food sector to benefit our people. I would conclude by saying that our relationship holds significant promise and potential. I am sure we will use this opportunity to further build upon our collaborations in the areas of food safety and security, agricultural technology, food processing, value chains, agricultural marketing and capacity building and take them to newer heights. As we continue to grow at a decent rate, Asian region is fast emerging as the main driving force for the global economy. While we may take comfort and satisfaction from the road we have covered so far, the journey ahead offers limitless opportunities. 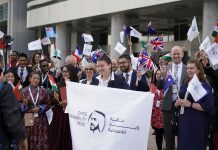 With our collective will, determination, and sincere endeavour, we can achieve far greater heights in our relationship.